Life has moved back into routine after a busy September and October. Fall seems to have finally resided in Provence and I now awaken to brisk mornings and crisp air. I happily welcome my favorite season of the year and always anxiously await for the cool temperatures to hush away the heat and for the colorful transformation of the foliage. And yet not too long ago, October was unusually mild, warmed by lingering Indian summer days, and it brought me back to the end of summer… and a luxurious day spent on the waters of the Mediterranean. It was the last weekend in August and we were celebrating the 18th birthday of Eric’s nephew with a day visiting the Le Parc National des Calanques. Located between Marseille and Cassis lies an almost 20km stretch of protected terrain and ocean, a watercolor palette chiseled with dramatic rocky white limestone cliffs that sharply descend into inlets of the crystal teal blue waters of the Mediterranean. 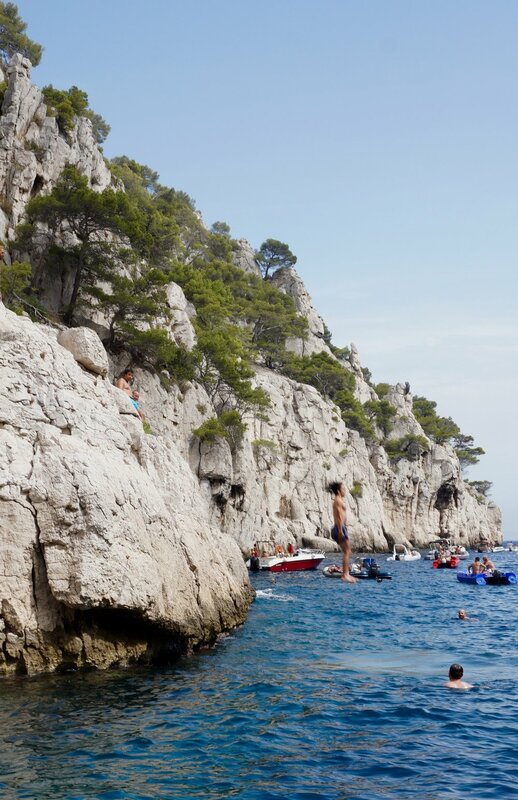 Designated a National Park in 2012, Les Calanques is a stunning display of nature and the elements. Only accessible by foot or sea, we choose the later… and chartered a boat and guide for the day. The attractions are obvious… the sheer beauty of the ocean, high cliffs, private coves filled with brilliant turquoise waters, hidden caves only approachable by swimming and even a nudist beach option for those who fancy… but what surprised me the most was the warmth and the color of the open sea. 74-degrees of deep sapphire blue colored ocean as I have never before seen. Floating amid the salty waves felt like being adrift a million miles from life. The worries of the world washed away by the warm sea breeze, the shimmering blue water and the therapeutic sounds of the ocean. Being at Les Calanques was new, but the being at the ocean felt… familiar. Seaside memories of moments passed fluttered to mind… family summer vacations spent at the east coast, life in Laguna, an oceanside summer in Italy, walks on silky white Florida sand and lazy days at the beach listening only to seagulls and the rhythm of the waves. It felt nostalgic, a return to a place that has been part of my life.